Rose Ledbury asked a little question about the walls she had seen at the bottom of the Drilley, a trackway from Blue Vein to the A365 and sparked off a new location for investigation by our readers. Any other comments about Drilley Bottom are welcomed. All readers who offered suggestions agreed that the stonework is old, probably before 1830 when the Devizes Road (A365 road) was started. Also, the use of dressed stone was expensive, so the structures weren’t temporary or cheap. Rose specifically asked about the walled pit at the bottom of the railings. The pit is about 7ft 6in long, 6ft 10in wide, and perhaps 3ft 6in deep (although might be deeper because there is a considerable amount of muddy deposit obscuring the bottom). It is entirely set below ground level with roughly dressed stone facing outwards on all sides and possibly a solid base. There are solid stone steps (or a platform) down on one side. The pit could have been further lined to be waterproof. There is no evidence of this but it does appear to be a container of some sort. One suggestion is that the pit could have been a fish pond (although rather small), or small reservoir. More probably it could have been an ice house. Certainly the pit is in a cold, sheltered north facing location. 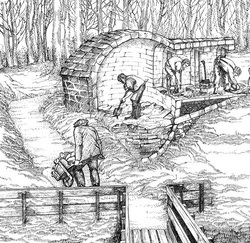 The usual method for ice houses was to pack snow into the pit in the winter and insulate with straw. The ice wasn’t for frivolous items (no gin and tonics!) but was vital to keep meat fresh in the summer. A possible source of ice might have been the pond downhill on the other side of the A365. The pit is fairly close to the old entranceway to Hatt House which has now been closed and a new entrance made from Short Hill. 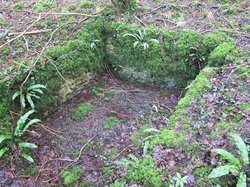 There is a second stone structure in the Drilley approximately 70 yards from the pit but the two appear to be unconnected. It is difficult to see the exact proportions. It appears to be about 12 feet square. 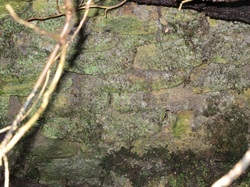 One wall is visible but the bank has collapsed obscuring other sections. It probably had only three sides, open onto the path. The wall runs at right angles to the slope, so it is unlikely to be a retaining wall to prevent subsidence. Another suggestion is that it was an animal enclosure but the finishing is also of roughly dressed stone (not rubble stone) and this is less likely. It might have been a dwelling of some sort. 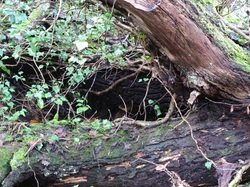 One reader has suggested that it could be a charcoal burner's shelter. 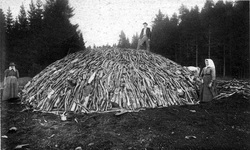 There is an abundant supply of beech and hazel trees on the slopes and small scale charcoal burning was common. The workers would live next to the kiln, maintaining constant vigilance to ensure the wood simmered but didn't burst into flame. Does anyone have further thoughts to solve Rose's Mystery of Drilley Bottom? Does anyone know of manufacturing near the Drilley?